For Volcano Extravaganza 2018 - Total Anastrophes. Courtesy of the Fiorucci Art Trust. During the Dhaka Art Summit. Courtesy Dhaka Art Summit and Fiorucci Art Trust. Photo credit: Noor Photoface. As part of the Volcano Extravaganza 2018 - Total Anastrophes, Dhaka Art Summit. Courtesy Dhaka Art Summit and Fiorucci Art Trust. Photo credit: Noor Photoface. As part of the Volcano Extravaganza 2018 – Total Anastrophes, Dhaka Art Summit. Courtesy Dhaka Art Summit and Fiorucci Art Trust. Photo credit: Noor Photoface. Patrizio Di Massimo's I Am Not the Body, I Am Not Even the Mind with Nicoletta Fiorucci. Within the frame of the Fiorucci Art Trust (whose stated aim is to ‘collect’ or promote art experiences), Total Anastrophes reimagined the 8th edition of the annual Volcano Extravaganza in Dhaka. Instead of engaging with Stromboli’s landscape and the talisman of its active volcano, the programme transformed the inside of the Shilpakala Academy’s Auditorium into the inner echo chamber of an active volcano. Performative interventions evoked themes of isolation and distance; memory and mysticism; cosmic energy and the violence of nature; improvisation and theatre. On the occasion of its 8th edition, the Volcano Extravaganza — the annual festival of contemporary arts conceived and produced by London-based non-profit institution, the Fiorucci Art Trust — erupted away from its volcanic centre in Stromboli. Taking the empirical and ephemeral experiences collected on the island, the Fiorucci Art Trust migrated the knowledge, the collaborations, the artists, the talks, the volcanic activities: the mind as a volcano and the emotional body with Total Anastrophes. The Artistic Leader was Bangladeshi-born, London-based artist Runa Islam, while the festival was curated, as per tradition, by Milovan Farronato. The participants included Cecilia Bengolea, Alex Cecchetti, Patrizio Di Massimo, Haroon Mirza, Tobias Putrih, Osman Yousefzada (OSMAN)- all figures belonging to the astral orbit of the Trust. After DAS 2018, the Volcano Extravaganza will move back to Stromboli, completing its own anastrophe in July 2018. Total Anastrophes is a figure of speech, a form of poetic license to indicate that something has been taken and moved away, in order to emphasise something else. An alteration of the typical order which might look like a mistake, a transmutation gone wrong: yet anastrophes have the gift to metamorphose a regular sentence into a re-energised version of itself, opening space for chaos, and creation. Away from Iddu (him), as the locals call the volcano of Stromboli, the intention of Fiorucci Art Trust was to create a collective experience. To orchestrate an adequate environment to celebrate self-reflection, remembrance, personal and collective latent memories, as the Trust gazed into its history, and to the many collaborations which have helped characterise it. The auditorium was turned into a theatre inside of a volcano, into an echo-chamber pervaded by sounds and moans, magmatic hertz, vibrations: frequencies of a harmonious language inside a unique cradle for performances, where voices were born from inscrutable sources and latent memories evoked. Visitors were greeted by slowed movements, reverberations and distorted sounds. 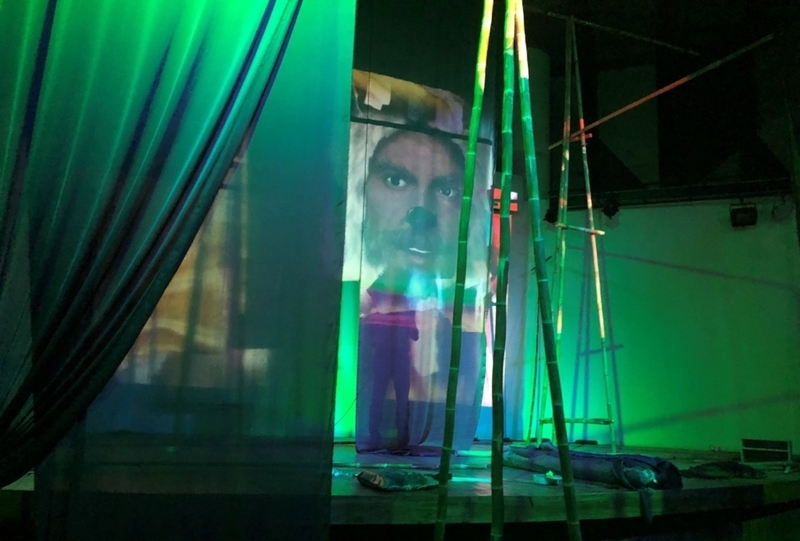 The echo chamber was inhabited by mobile architectural structures conceived by Tobias Putrih in dialogue with visual imagery and motifs by Runa Islam, acting simultaneously as diaphragms and screens, altering the space to dissolve the border between spectatorship and performers. Moreover, the same drapes of fabrics and textiles hanging from the mobiles became subjects for OSMAN to perform tailoring cutouts and create new designs on the spot, together with local seamstresses, as in a workshop. Re-contextualising both earlier and new performances from their bodies of work, live interventions by Alex Cecchetti and Patrizio Di Massimo were the voice of the echo-chamber. Cecilia Bengolea also drew from her own production history, to trigger and improvise movements and action in the space, through old and new choreographies. Haroon Mirza orchestrated a soundscape for the auditorium: an environment where a distorted sonority synchronised with a visual choreography of LEDs danced in conjunction with his own footage of Stromboli. Audiovisual contributions by Alec Curtis, Anna Boughighian, Roberto Cuoghi, Joana Escoval, Chiara Fumai, Liliana Moro, Christodoulos Panayiotou, Naufus Ramírez-Figueroa and Mathilde Rosier, among others, alternatively intervened in the landscape.